We transfer from Rome Fiumicino airport (2 hours) to San Luca, where we stay at a fine villa surrounded by vineyards; and discover some of Italy's finest, though little known, red wines made from the Sagrantino grape. We walk up through the Sagrantino vineyards to hilltop Montefalco, ‘the balcony of Umbria’. We visit the Church of San Francesco before continuing on down through renowned vineyards to the walled town of Bevagna (9 miles, 5 hours). 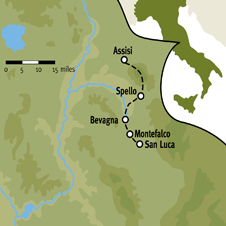 After visiting Bevagna’s Roman theatre and baths, we walk across the valley to Spello, where there is time to explore the Roman and Medieval town (7.1 miles, 3.5 hours). We walk up through scrub and pine woods to the high meadows of Monte Subasio (1,290m, 4,232 ft), and follow the high grassy ridge (with possibly a dusting of snow) to a hot ATG picnic lunch – high on Monte Subasio if the weather is fine. Our descent into Assisi follows an ancient path used by St Francis. (11 miles/5.5 hours). Christmas Day. Free time to explore the lovely medieval city with its magnificent churches and frescoes; and the opportunity to visit other key Franciscan sites near the town, including the Eremo delle Carceri and Basilica of Santa Maria degli Angeli. Weather permitting, we enjoy a hot picnic lunch near the 14th century Rocca Maggiore that dominates the old town. Dinner in an excellent local restaurant. We return to Rome Fiumicino airport by road (3 hours). If you would like an extension booking at either end of your trip please indicate this during the booking process and we will contact you with pricing information. The terrain for our Assisi Christmas trip will be along farm tracks, mule paths, dirt roads, stony tracks. Springy turf across Monte Subasio. Some steep ascents and descents. The fitness level of this trip is Grade 2-3+. The only challenging day is the walk over Monte Subasio. Restaurants of distinction and a wide range of hearty Umbrian dishes. Original seasonal recipes with game, wild boar, sausages, lentils, polenta and pasta with black truffles. Delicious cured meats and cheeses. Wine: Montefalco is renowned for being one of Italy’s most innovative wine-making areas, especially Rosso di Montefalco and Sagrantino DOCG, with its incomparable Passito variety. What is the maximum group size for this trip? Hello, the maximum group size is 16, plus 2 Tour Consultants. with each itinerary. In winter it is cool, crisp and fresh, with bright days. 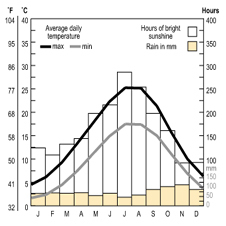 There is the possibility of rain, wind and snow and cold, particularly on Monte Subasio. You should come prepared with warm layers and waterproofs, hat, gloves and sunglasses. means hours of actual walking and does not include stops for lunch, sightseeing, rests or siestas. The fitness level of this walking holiday is Grade 2- 3+ . The paths are varied: tarmac road, dirt track, short sections through fields, freestyle across the grassy (possibly snowy) mountain top, and a stretch of steep rocky/gravelly downhill track. In wet weather short sections of the route become muddy. On the final walking day, there is a big climb over the summit of a large isolated mountain. This day is quite strenuous (Grade 3+). The other days are more leisurely, walking over rolling hills and a flat wide floodplain. There are no vertiginous walks. The destination airport for this Assisi Christmas trip is Rome Fiumicino. There will be a set meeting time at Rome Fiumicino airport for the transfer to the first hotel; a set time for the return transfer to the airport at the end of the trip; and a 'recommended flight' to connect with the airport transfers. Booking the recommended flight - which we strongly encourage - guarantees transfers to and from the airport, irrespective of flight schedule changes or delays. For clients not on the 'recommended flight' we cannot guarantee a transfer from the airport should you be delayed for any reason in meeting the group at the specified place and time. In this instance you will have to make your own way to the first hotel, at your own expense. The transfer to the airport at the end of the trip will also be timed according to the recommended flight and we cannot offer transfers at alternative times. Please check with the Reservations Team before making independent arrangements. On our Assisi Christmas walking holiday all meals are included. varied. However, Umbria’s most prized and treasured speciality is the truffle, used sparingly in sauces and oils for its strong flavour. the wines to the style of the restaurant and the cuisine provided, and to sample local wines whenever possible. Local wines are provided with the picnic lunch but you will probably find that in view of the walking you will appreciate the water more than the wine. We therefore tend to serve the better wines in the evenings. There is really no need to dress up for any of the restaurants – smart/casual-wear is fine. You may like to bring something special for Christmas Eve (but not formal).